As CCTV cameras can now capture even higher picture resolutions through the use of HD sensor technology and advanced processing, the lenses also need to have an optical resolution that allows the camera to work at its optimal point. This range of Super Resolution (SR) megapixel lenses is designed to provide improved image resolution and sharpness, and better depth of field while avoiding the diffraction issues which can occur with megapixel sensors. They provide long and reliable operation with no maintenance. These varifocal lenses range from wideangle to telephoto to cover virtually all applications in CCTV observation systems. This series of SR megapixel lenses includes varifocal lenses with SR-iris control. They are compact and available in 1/2.5‑inch and 1/2‑inch image formats. The extent of the range means that an installer is always able to select the most appropriate lens for both camera and application. These lenses come with a standard C or CS mount for use with a variety of cameras. 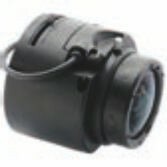 The iris control connection is a four-pin standard plug that fits directly into the camera’s iris output. The lenses deliver impressive optical quality due to their mega pixel resolution, contrast reproduction, and coating. The mechanical construction is designed to withstand both frequent iris control operations and the environmental stress of security installations. For flexible, high-quality, reliable lenses that match a HD camera’s performance, this series is the ideal solution.